Local farmers and property owners housing H-2A workers in residential neighborhoods can breathe easy—for now. The Santa Maria City Council voted on April 17 not to extend an urgency ordinance prohibiting property owners from housing more than six H-2A guest workers in units located in single-family and medium-density residential zoning districts. The ordinance, which was passed unanimously by council members on March 20 in an effort to preserve residential housing for long-term residents, will now expire on May 4. Formerly the Budget Inn, a motel on North Broadway in Santa Maria houses H-2A workers for Bonita Packing Company (pictured in 2016). Santa Maria City Council members said in recent meetings that they fully support H-2A housing projects like Broadway Eleven, where workers are centrally located and out of residential neighborhoods. “I was very surprised because it was passed 5-0 at the meeting in March,” Councilmember Jack Boysen told the Sun. Unlike several of his fellow council members, Boysen voted to extend the ordinance at the April 17 meeting. The federal H-2A program allows farmers to bring vetted nonimmigrant workers into the U.S. to provide much-needed agricultural labor for a limited time, according to a city staff report. The temporary guest workers are paid and provided with transportation, food, and housing. 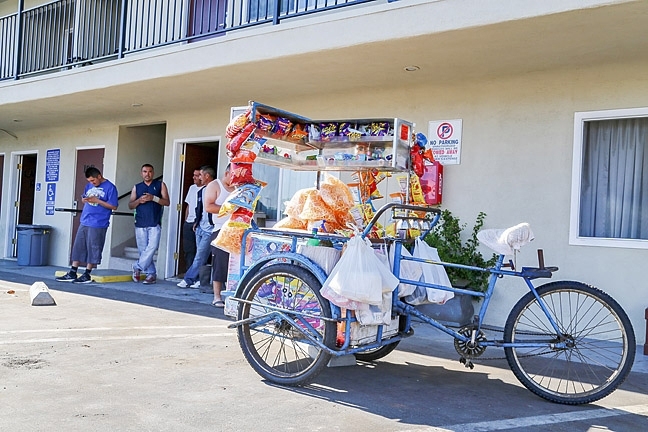 But several recent complaints regarding H-2A housing and its growing presence in Santa Maria’s residential neighborhoods sparked the city’s interest in the issue. Several community members told city staff at the March 20 meeting that many residential property owners are choosing to house temporary H-2A workers rather than long-term residents. Agricultural employers and labor contractors—many that are in desperate need of labor—are willing to pay huge sums of money to house H-2A workers, according to a staff report, sometimes more than double market price. That incentive, the staff report states, could make it even more difficult for properties to be available for long-term residents to rent or buy property in a city already experiencing a housing shortage. Roughly 30 employers use H-2A workers in Santa Maria, according to data compiled by Assistant City Attorney Philip Sinco, and there are 75 sites where workers are being housed citywide. There are about five or six sites used for H-2A housing in Guadalupe. Councilmember Boysen said long-term residents shouldn’t have to compete with H-2A workers for housing. He added that the city also doesn’t allow more than six individuals in residential boarding and sober living houses. Owners wanting to house more than six people in those facilities have to obtain conditional-use permits through the city, Boysen said. Still, the overwhelming majority of public speakers at the April 17 meeting opposed the ordinance, which they said was hastily approved with little thought for how it would affect local farmers. Claire Wineman, president of the Grower-Shipper Association of Santa Barbara and SLO counties, said a 10-month extension of the restriction would have hurt farmers already planning for next season’s crops. Planting decisions, she said, are often made a year in advance, and the availability of labor, or lack thereof, is increasingly factoring into those decisions. Although many council members expressed concern that farmers and property owners could potentially abuse the H-2A program by housing inhumane numbers of workers in small residential houses, Wineman said that is unlikely. The H-2A program is heavily regulated by the U.S. Department of Labor and the California Employment Development Department, Wineman said, and all H-2A properties are thoroughly inspected. Wineman said the Grower-Shipper Association is looking forward to working with the city and concerned community members to find a reasonable solution to housing H-2A workers, who she said have helped many farmers survive since the labor shortage began in 2012. But longtime community members like Cheryl Ausan were disappointed to hear that city council voted against the ordinance. A house in Ausan’s residential neighborhood, where she’s lived for decades, sold in January to an owner housing H-2A workers. Ausan said property owners and farmers wanting to house more than six H-2A workers should have to go through a conditional-use permit process, just like other group-home owners do. Assistant City Attorney Sinco said the city will be considering that as a viable option, although he said those permits can be quite costly to obtain. For now, Sinco said he and city staff plan to hold regular community forums and discussions regarding the nature of the H-2A program. All stakeholders will be invited, he said, and finding a solution could take time. “We want to do this right,” Sinco said.